There had been a number of movies made in malayalam which portrayed the life of thieves on silver screen. Movie lovers might not forget the extraordinary performances shown by actors like Mammooty, Dileep, and Prithviraj donning the role of burglar in various movies. Noted among would be Mammootty's interesting role as the multifaceted thief in Kalikkalam and Thaskaraveeran, Dileep's clever robber in Meesa Madhavan and Prithviraj as a munificent thief in Robinhood. In the recent past movies which focused on the life of thieves did get much appreciation for the movie enthusiasts. Good examples would be Jis Joy's Bicycle Thieves, Nixon George's Bunty Chor. Debutant Binu S' upcoming release Ithihasa too revolves around the life of two pickpockets. Adding more fuel to the theme, yet another movie is under making which will tell the story of seven gentlemen thieves. The project titled 'Sapthamashri Thaskara' helmed by national award winner Anil Radhakrishna Menon will have Prithviraj in lead. It is also reported that young actor Fahadh Faasil too is also in the cast. 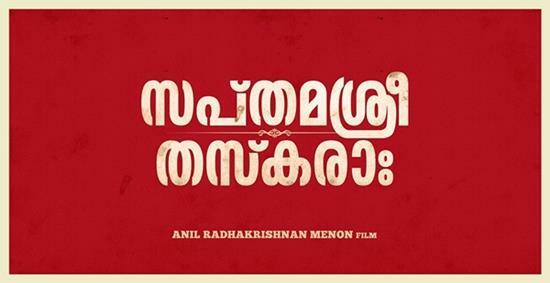 'Sapthamashri Thaskara', which means seven gentlemen thieves in Sanskrit will be produced by Prithviraj under his own production house, August Cinemas. Heard from the grapevine, the storyline of 'Sapthamashri Thaskara' is similar to the super hit Hollywood movie Ocean's Eleven. Prithviraj who was deeply impressed with the script instigated to invest money for the movie. This comedy flick would be creamed with all elements which would entertain the fun loving audience. Prithviraj who is riding on the success of '7th Day' has a bunch of movies to be completed in 2014. He is currently busy with his next committed project 'Tamaar Padaar', a complete family entertainer. Prithviraj will be playing a full-length humourist in this movie. Directed by Dileesh Nair, the movie is produced by Renjith Rejaputhra under the banner of Rejaputhra Films. Biju Menon also plays a pivotal role in this movie.